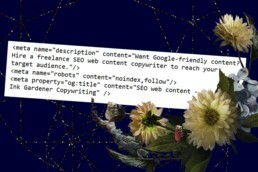 I write enticing words for your website to attract Google and your ideal customers. Writing Google-friendly web content is known as Search Engine Optimisation or SEO. Software ‘robots’ crawl across the web to index it. Hidden indexing, sentence length and even how you label your photos all help your pages stand out. But the content also has to make sense to humans. I can write your web content from scratch or adapt your existing content. I’ve been a SEO web content copywriter for more than 20 years, so know the ropes. What do you want the website to achieve – more orders? Raising awareness? What are your unique selling points compared to your competitors? Struggling with planning and naming your website navigation and pages? I can provide a site map that makes sense to your customers and Google. This saves you time and means your messages will be consistent across the board. A win-win all round. Please take a look at FAQs or contact me at helen@inkgardener.co.uk or on 07929 948 743.